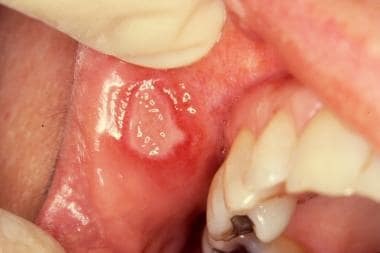 Aphthous stomatitis, also known as recurrent aphthous ulcers or canker sores, is among the most common oral mucosal lesion physicians and dentists observe. Aphthous stomatitis is a disorder of unknown etiology that may cause significant morbidity. One or several discrete, shallow, painful ulcers are visible on the unattached oral mucous membranes. Individual ulcers typically last 7-10 days and heal without scarring. Larger ulcers may last several weeks to months and can scar when healing. Although the process in idiopathic recurrent aphthous ulcers is usually self-limiting, in some individuals, ulcer activity can be almost continuous. Similar ulcers can be noted in the genital region. Behçet syndrome, systemic lupus erythematosus, and inflammatory bowel disease are systemic diseases associated with oral recurrent aphthous ulcers. The clinical presentation of aphthous ulcers is defined by the number of recurrences and severity of disease. Clinically, the number and size of the ulcers are the two main criteria used to divide ulcers into three forms: minor, major, and herpetiform. Simple aphthae are common and considered mild, with 1-4 episodes per year. In general, there are few lesions of the minor or herpetiform form. In contrast, complex aphthosis has a severe clinical course, with an almost continuous presence of minor or major ulcers. These may be debilitating and may also involve the genitalia of both men and women. It is imperative that these patients be evaluated to rule out Behçet disease as well as inflammatory bowel disease. This is the most common form, accounting for 80-85% of cases. Discrete, painful, shallow, recurrent ulcers smaller than 1 cm in diameter characterize this form, shown in the image below. At any time, one or multiple ulcers can be manifest. These ulcers heal within 7-14 days without scarring. The periodicity varies among individuals, with some having long ulcer-free episodes and some never being free from ulcers. Minor aphthous ulcer: Small superficial oval erosions with yellow pseudomembrane and an erythematous border are evident on the labial aspect of the left lower lip. This form accounts for about 5-10% of cases and present as round or oval ulcers that range in size from 2-3 cm in diameter, as shown in the image below. Major aphthae typically present as a single ulcer, but multiple ulcers may occur. The ulcers present on the soft palate, lips, or oropharynx. They may be deep with smooth or irregular borders. The ulcers may coalesce. Healing, which may take 6 weeks or even months, results in scarring; severe distortion of oral and pharyngeal mucosa may occur. These are more common in patients with HIV disease. Major aphthous ulcer: Large oval ulcer with white pseudomembrane and raised red border located on the right upper labial mucosa adjacent to the buccal commissure. Note the irregular margin so typical in major aphthae. In this rare form (<5% of cases), ulcers are typically about 1-2 mm in diameter. The aphthae tend to occur in clusters or crops consisting of 10-100 ulcers. Clusters may be small and localized, or they may be distributed throughout the soft mucosa of the oral cavity. These too occur predominantly on unkeratinized mucosa, as shown in the image below. It is important to differentiate these ulcers from herpes simplex virus (HSV), which also may appear as recurrent crops. 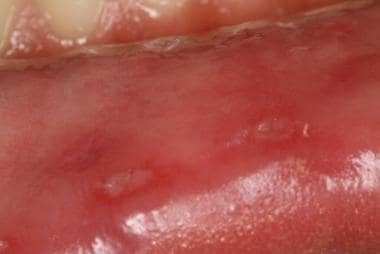 HSV is an infectious disease that often presents with vesicles that quickly ulcerate and involve the keratinized mucosa of the hard palate, dorsal tongue and attached gingiva. Herpetiform aphthous ulcer: Grouped and single tiny white to yellow ulcers scattered on the labial mucosa and on the ventral aspect of the tongue. For patient education resources, visit the Oral Health Center. Also, see the patient education article Canker Sores. Crivelli MR, Aguas S, Adler I, Quarracino C, Bazerque P. Influence of socioeconomic status on oral mucosa lesion prevalence in schoolchildren. Community Dent Oral Epidemiol. 1988 Feb. 16(1):58-60. [Medline]. Shulman JD. An exploration of point, annual, and lifetime prevalence in characterizing recurrent aphthous stomatitis in USA children and youths. J Oral Pathol Med. 2004 Oct. 33 (9):558-66. [Medline]. Axéll T, Henricsson V. The occurrence of recurrent aphthous ulcers in an adult Swedish population. Acta Odontol Scand. 1985 May. 43(2):121-5. [Medline]. Embil JA, Stephens RG, Manuel FR. Prevalence of recurrent herpes labialis and aphthous ulcers among young adults on six continents. Can Med Assoc J. 1975 Oct 4. 113 (7):627-30. [Medline]. Axéll T. A prevalence study of oral mucosal lesions in an adult Swedish population. Odontol Revy Suppl. 1976. 36:1-103. [Medline]. Robledo-Sierra J, Mattsson U, Svedensten T, Jontell M. The morbidity of oral mucosal lesions in an adult Swedish population. Med Oral Patol Oral Cir Bucal. 2013 Sep 1. 18 (5):e766-72. [Medline]. Cebeci AR, Gülşahi A, Kamburoglu K, Orhan BK, Oztaş B. Prevalence and distribution of oral mucosal lesions in an adult Turkish population. Med Oral Patol Oral Cir Bucal. 2009 Jun 1. 14 (6):E272-7. [Medline]. Mumcu G, Cimilli H, Sur H, Hayran O, Atalay T. Prevalence and distribution of oral lesions: a cross-sectional study in Turkey. Oral Dis. 2005 Mar. 11 (2):81-7. [Medline]. Safadi RA. Prevalence of recurrent aphthous ulceration in Jordanian dental patients. BMC Oral Health. 2009 Nov 22. 9:31. [Medline]. Davatchi F, Tehrani-Banihashemi A, Jamshidi AR, et al. The prevalence of oral aphthosis in a normal population in Iran: a WHO-ILAR COPCORD study. Arch Iran Med. 2008 Mar. 11 (2):207-9. [Medline]. Abdullah MJ. Prevalence of recurrent aphthous ulceration experience in patients attending Piramird dental speciality in Sulaimani City. J Clin Exp Dent. 2013 Apr 1. 5 (2):e89-94. [Medline]. Bhatnagar P, Rai S, Bhatnagar G, Kaur M, Goel S, Prabhat M. Prevalence study of oral mucosal lesions, mucosal variants, and treatment required for patients reporting to a dental school in North India: In accordance with WHO guidelines. J Family Community Med. 2013 Jan. 20 (1):41-8. [Medline]. Thangadurai M, Andamuthu Y, Srinivasan A, Abikshyeet P, Kumar SJS, Vilvanathan V. Prevalence and family history of recurrent aphthous stomatitis among the students of a dental institution in south India. J Indian Acad Dental Specialist Researchers. 2014. 1(2):53-55. Field EA, Brookes V, Tyldesley WR. Recurrent aphthous ulceration in children--a review. Int J Paediatr Dent. 1992 Apr. 2 (1):1-10. [Medline]. Lopez-Jornet P, Camacho-Alonso F, Martos N. Hematological study of patients with aphthous stomatitis. Int J Dermatol. 2014 Feb. 53 (2):159-63. [Medline]. Sun A, Chen HM, Cheng SJ, Wang YP, Chang JY, Wu YC, et al. Significant association of deficiencies of hemoglobin, iron, vitamin B12, and folic acid and high homocysteine level with recurrent aphthous stomatitis. J Oral Pathol Med. 2015 Apr. 44 (4):300-5. [Medline]. Gallo Cde B, Mimura MA, Sugaya NN. Psychological stress and recurrent aphthous stomatitis. Clinics (Sao Paulo). 2009. 64(7):645-8. [Medline]. [Full Text]. Huling LB, Baccaglini L, Choquette L, Feinn RS, Lalla RV. Effect of stressful life events on the onset and duration of recurrent aphthous stomatitis. J Oral Pathol Med. 2012 Feb. 41(2):149-52. [Medline]. [Full Text]. MacPhail LA, Greenspan D, Feigal DW, Lennette ET, Greenspan JS. Recurrent aphthous ulcers in association with HIV infection. Description of ulcer types and analysis of T-lymphocyte subsets. Oral Surg Oral Med Oral Pathol. 1991 Jun. 71(6):678-83. [Medline]. Burton-Kee JE, Mowbray JF, Lehner T. Different cross-reacting circulating immune complexes in Behçet's syndrome and recurrent oral ulcers. J Lab Clin Med. 1981 Apr. 97(4):559-67. [Medline]. Eglin RP, Lehner T, Subak-Sharpe JH. Detection of RNA complementary to herpes-simplex virus in mononuclear cells from patients with Behçet's syndrome and recurrent oral ulcers. Lancet. 1982 Dec 18. 2(8312):1356-61. [Medline]. Jorizzo JL. Behcet's disease. Freedberg IM, Eisen AZ, Wolff K, et al, eds. Dermatology in General Medicine. New York: McGraw-Hill Professional; 1999. Vol 2: 2161-5. Sakane T, Takeno M, Suzuki N, Inaba G. Behçet's disease. N Engl J Med. 1999 Oct 21. 341(17):1284-91. [Medline]. Studd M, McCance DJ, Lehner T. Detection of HSV-1 DNA in patients with Behçet's syndrome and in patients with recurrent oral ulcers by the polymerase chain reaction. J Med Microbiol. 1991 Jan. 34(1):39-43. [Medline]. Adisen E, Aral A, Aybay C, Gürer MA. Salivary epidermal growth factor levels in Behçet's disease and recurrent aphthous stomatitis. Dermatology. 2008. 217(3):235-40. [Medline]. Hazzaa HH, Rashwan WA, Attia EA. IL-18 gene polymorphisms in aphthous stomatitis vs. Behçet's disease in a cohort of Egyptian patients. J Oral Pathol Med. 2014 Nov. 43 (10):746-53. [Medline]. Ferguson MM, Wray D, Carmichael HA, Russell RI, Lee FD. Coeliac disease associated with recurrent aphthae. Gut. 1980 Mar. 21(3):223-6. [Medline]. Ferguson R, Basu MK, Asquith P, Cooke WT. Jejunal mucosal abnormalities in patients with recurrent aphthous ulceration. Br Med J. 1976 Jan 3. 1(6000):11-13. [Medline]. Wray D. Gluten-sensitive recurrent aphthous stomatitis. Dig Dis Sci. 1981 Aug. 26(8):737-40. [Medline]. Yasar S, Yasar B, Abut E, Asiran Serdar Z. Clinical importance of celiac disease in patients with recurrent aphthous stomatitis. Turk J Gastroenterol. 2012 Feb. 23(1):14-8. [Medline]. de Carvalho FK, de Queiroz AM, Bezerra da Silva RA, Sawamura R, Bachmann L, Bezerra da Silva LA, et al. Oral aspects in celiac disease children: clinical and dental enamel chemical evaluation. Oral Surg Oral Med Oral Pathol Oral Radiol. 2015 Jun. 119 (6):636-43. [Medline]. Miller MF, Garfunkel AA, Ram C, Ship II. Inheritance patterns in recurrent aphthous ulcers: twin and pedigree data. Oral Surg Oral Med Oral Pathol. 1977 Jun. 43(6):886-91. [Medline]. Slebioda Z, Szponar E, Kowalska A. Recurrent aphthous stomatitis: genetic aspects of etiology. Postepy Dermatol Alergol. 2013 Apr. 30 (2):96-102. [Medline]. Bidoki AZ, Harsini S, Sadr M, Soltani S, Mohammadzadeh M, Najafi S, et al. NLRP3 gene polymorphisms in Iranian patients with recurrent aphthous stomatitis. J Oral Pathol Med. 2015 May 28. [Medline]. Najafi S, Yousefi H, Mohammadzadeh M, Bidoki AZ, Firouze Moqadam I, Farhadi E, et al. Association study of interleukin-1 family and interleukin-6 gene single nucleotide polymorphisms in recurrent aphthous stomatitis. Int J Immunogenet. 2015 Dec. 42 (6):428-31. [Medline]. Wilhelmsen NS, Weber R, Monteiro F, Kalil J, Miziara ID. Correlation between histocompatibility antigens and recurrent aphthous stomatitis in the Brazilian population. Braz J Otorhinolaryngol. 2009 May-Jun. 75(3):426-31. [Medline]. Kozlak ST, Walsh SJ, Lalla RV. Reduced dietary intake of vitamin B12 and folate in patients with recurrent aphthous stomatitis. J Oral Pathol Med. 2010 Feb 7. [Medline]. Carrozzo M. Vitamin B12 for the treatment of recurrent aphthous stomatitis. Evid Based Dent. 2009. 10(4):114-5. [Medline]. Baccaglini L, Lalla RV, Bruce AJ, Sartori-Valinotti JC, Latortue MC, Carrozzo M, et al. Urban legends: recurrent aphthous stomatitis. Oral Dis. 2011 Nov. 17(8):755-70. [Medline]. [Full Text]. Yasui K, Kurata T, Yashiro M, Tsuge M, Ohtsuki S, Morishima T. The effect of ascorbate on minor recurrent aphthous stomatitis. Acta Paediatr. 2009 Dec 10. [Medline]. Khabbazi A, Ghorbanihaghjo A, Fanood F, Kolahi S, Hajialiloo M, Rashtchizadeh N. A comparative study of vitamin D serum levels in patients with recurrent aphthous stomatitis. Egyptian Rheumatol. 2015. 37(3):133-37. Sun A, Chu CT, Wu YC, Yuan JH. Mechanisms of depressed natural killer cell activity in recurrent aphthous ulcers. Clin Immunol Immunopathol. 1991 Jul. 60(1):83-92. [Medline]. Lewkowicz N, Kur B, Kurnatowska A, Tchorzewski H, Lewkowicz P. Expression of Th1/Th2/Th3/Th17-related genes in recurrent aphthous ulcers. Arch Immunol Ther Exp (Warsz). 2011 Oct. 59(5):399-406. [Medline]. Taylor LJ, Bagg J, Walker DM, Peters TJ. Increased production of tumour necrosis factor by peripheral blood leukocytes in patients with recurrent oral aphthous ulceration. J Oral Pathol Med. 1992 Jan. 21(1):21-5. [Medline]. Hasan A, Childerstone A, Pervin K, et al. Recognition of a unique peptide epitope of the mycobacterial and human heat shock protein 65-60 antigen by T cells of patients with recurrent oral ulcers. Clin Exp Immunol. 1995 Mar. 99(3):392-7. [Medline]. Miyamoto NT Jr, Borra RC, Abreu M, Weckx LL, Franco M. Immune-expression of HSP27 and IL-10 in recurrent aphthous ulceration. J Oral Pathol Med. 2008 Sep. 37(8):462-7. [Medline]. Albanidou-Farmaki E, Poulopoulos AK, Epivatianos A, Farmakis K, Karamouzis M, Antoniades D. Increased anxiety level and high salivary and serum cortisol concentrations in patients with recurrent aphthous stomatitis. Tohoku J Exp Med. 2008 Apr. 214(4):291-6. [Medline]. Borra RC, de Mesquita Barros F, de Andrade Lotufo M, Villanova FE, Andrade PM. Toll-like receptor activity in recurrent aphthous ulceration. J Oral Pathol Med. 2009 Mar. 38(3):289-98. [Medline]. Arikan S, Durusoy C, Akalin N, Haberal A, Seckin D. Oxidant/antioxidant status in recurrent aphthous stomatitis. Oral Dis. 2009 Oct. 15(7):512-5. [Medline]. Bagan J, Saez G, Tormos C, Gavalda C, Sanchis JM, Bagan L, et al. Oxidative stress and recurrent aphthous stomatitis. Clin Oral Investig. 2014 Nov. 18 (8):1919-23. [Medline]. Ozdemir IY, Calka O, Karadag AS, Akdeniz N, Ozturk M. Thyroid autoimmunity associated with recurrent aphthous stomatitis. J Eur Acad Dermatol Venereol. 2012 Feb. 26(2):226-30. [Medline]. Ghodratnama F, Wray D, Bagg J. Detection of serum antibodies against cytomegalovirus, varicella zoster virus and human herpesvirus 6 in patients with recurrent aphthous stomatitis. J Oral Pathol Med. 1999 Jan. 28(1):12-5. [Medline]. Pedersen A, Hornsleth A. Recurrent aphthous ulceration: a possible clinical manifestation of reactivation of varicella zoster or cytomegalovirus infection. J Oral Pathol Med. 1993 Feb. 22(2):64-8. [Medline]. Li L, Gu H, Zhang G. Association between recurrent aphthous stomatitis and Helicobacter pylori infection: a meta-analysis. Clin Oral Investig. 2014 Jul. 18 (6):1553-60. [Medline]. Albanidou-Farmaki E, Giannoulis L, Markopoulos A, et al. Outcome following treatment for Helicobacter pylori in patients with recurrent aphthous stomatitis. Oral Dis. 2005 Jan. 11(1):22-6. [Medline]. Birek C, Grandhi R, McNeill K, Singer D, Ficarra G, Bowden G. Detection of Helicobacter pylori in oral aphthous ulcers. J Oral Pathol Med. 1999 May. 28(5):197-203. [Medline]. Elsheikh MN, Mahfouz ME. Prevalence of Helicobacter pylori DNA in recurrent aphthous ulcerations in mucosa-associated lymphoid tissues of the pharynx. Arch Otolaryngol Head Neck Surg. 2005 Sep. 131(9):804-8. [Medline]. Mansour-Ghanaei F, Asmar M, Bagherzadeh AH, Ekbataninezhad S. Helicobacter pylori infection in oral lesions of patients with recurrent aphthous stomatitis. Med Sci Monit. 2005 Dec. 11(12):CR576-9. [Medline]. Porter SR, Barker GR, Scully C, Macfarlane G, Bain L. Serum IgG antibodies to Helicobacter pylori in patients with recurrent aphthous stomatitis and other oral disorders. Oral Surg Oral Med Oral Pathol Oral Radiol Endod. 1997 Mar. 83(3):325-8. [Medline]. Hijazi K, Lowe T, Meharg C, Berry SH, Foley J, Hold GL. Mucosal microbiome in patients with recurrent aphthous stomatitis. J Dent Res. 2015 Mar. 94 (3 Suppl):87S-94S. [Medline]. Hay KD, Reade PC. The use of an elimination diet in the treatment of recurrent aphthous ulceration of the oral cavity. Oral Surg Oral Med Oral Pathol. 1984 May. 57 (5):504-7. [Medline]. Shim YJ, Choi JH, Ahn HJ, Kwon JS. Effect of sodium lauryl sulfate on recurrent aphthous stomatitis: a randomized controlled clinical trial. Oral Dis. 2012 Oct. 18 (7):655-60. [Medline]. Herlofson BB, Barkvoll P. Sodium lauryl sulfate and recurrent aphthous ulcers. A preliminary study. Acta Odontol Scand. 1994 Oct. 52 (5):257-9. [Medline]. Hasan AA, Ciancio S. Association between ingestion of nonsteroidal anti-inflammatory drugs and the emergence of aphthous-like ulcers. J Int Acad Periodontol. 2009 Jan. 11(1):155-9. [Medline]. Scully C, Gorsky M, Lozada-Nur F. The diagnosis and management of recurrent aphthous stomatitis: a consensus approach. J Am Dent Assoc. 2003 Feb. 134 (2):200-7. [Medline]. Samaranayake LPK, Cheung L. Samaranayake YH. Candidiasis and other fungal diseases of the mouth. Dermatol Ther. 2001. 15:251-69. Abahussein O. Ulceration in Rheumatic Disease. Matucci-Cerinic M, Furst D, Fiorentino E, eds. Skin Manifestations in Rheumatic Disease. 1st ed. New York, NY: Springer-Verlag; 2014. 63-70. Daley TD, Armstrong JE. Oral manifestations of gastrointestinal diseases. Can J Gastroenterol. 2007 Apr. 21 (4):241-4. [Medline]. Cohen PR. Sweet's syndrome--a comprehensive review of an acute febrile neutrophilic dermatosis. Orphanet J Rare Dis. 2007 Jul 26. 2:34. [Medline]. Boxer L, Dale DC. Neutropenia: causes and consequences. Semin Hematol. 2002 Apr. 39 (2):75-81. [Medline]. Padeh S, Stoffman N, Berkun Y. 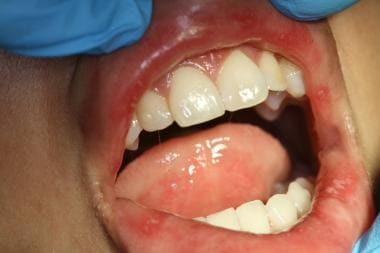 Periodic fever accompanied by aphthous stomatitis, pharyngitis and cervical adenitis syndrome (PFAPA syndrome) in adults. Isr Med Assoc J. 2008 May. 10(5):358-60. [Medline]. Cantarini L, Vitale A, Bartolomei B, Galeazzi M, Rigante D. Diagnosis of PFAPA syndrome applied to a cohort of 17 adults with unexplained recurrent fevers. Clin Exp Rheumatol. 2012 Mar-Apr. 30(2):269-71. [Medline]. Imai H, Motegi M, Mizuki N, Ohtani H, Komatsuda A, Hamai K, et al. Mouth and genital ulcers with inflamed cartilage (MAGIC syndrome): a case report and literature review. Am J Med Sci. 1997 Nov. 314 (5):330-2. [Medline]. Ramírez-Amador V, Esquivel-Pedraza L, Sierra-Madero J, Anaya-Saavedra G, González-Ramírez I, Ponce-de-León S. The Changing Clinical Spectrum of Human Immunodeficiency Virus (HIV)-Related Oral Lesions in 1,000 Consecutive Patients: A 12-Year Study in a Referral Center in Mexico. Medicine (Baltimore). 2003 Jan. 82 (1):39-50. [Medline]. Kimura S, Kuroda J, Akaogi T, Hayashi H, Kobayashi Y, Kondo M. Trisomy 8 involved in myelodysplastic syndromes as a risk factor for intestinal ulcers and thrombosis--Behçet's syndrome. Leuk Lymphoma. 2001 Jun. 42 (1-2):115-21. [Medline]. Davatchi F. Diagnosis/Classification Criteria for Behcet's Disease. Patholog Res Int. 2012. 2012:607921. [Medline]. O'Neill TW, Rigby AS, Silman AJ, Barnes C. Validation of the International Study Group criteria for Behçet's disease. Br J Rheumatol. 1994 Feb. 33 (2):115-7. [Medline]. Tappuni AR, Kovacevic T, Shirlaw PJ, Challacombe SJ. Clinical assessment of disease severity in recurrent aphthous stomatitis. J Oral Pathol Med. 2013 Sep. 42 (8):635-41. [Medline]. Challacombe SJ, Alsahaf S, Tappuni A. Recurrent Aphthous Stomatitis: Towards Evidence-Based Treatment?. Curr Oral Health Rep. 2015. 2:158-67. Ekiz O, Balta I, Sen BB, Rifaioglu EN, Ergin C, Balta S, et al. Mean platelet volume in recurrent aphthous stomatitis and Behçet disease. Angiology. 2014 Feb. 65 (2):161-5. [Medline]. Rogers RS 3rd, Hutton KP. Screening for haematinic deficiencies in patients with recurrent aphthous stomatitis. Australas J Dermatol. 1986 Dec. 27(3):98-103. [Medline]. Alidaee MR, Taheri A, Mansoori P, Ghodsi SZ. Silver nitrate cautery in aphthous stomatitis: a randomized controlled trial. Br J Dermatol. 2005 Sep. 153(3):521-5. [Medline]. Brice SL. Clinical evaluation of the use of low-intensity ultrasound in the treatment of recurrent aphthous stomatitis. Oral Surg Oral Med Oral Pathol Oral Radiol Endod. 1997 Jan. 83(1):14-20. [Medline]. Brocklehurst P, Tickle M, Glenny AM, Lewis MA, Pemberton MN, Taylor J, et al. Systemic interventions for recurrent aphthous stomatitis (mouth ulcers). Cochrane Database Syst Rev. 2012 Sep 12. 9:CD005411. [Medline]. Liu C, Zhou Z, Liu G, Wang Q, Chen J, Wang L, et al. Efficacy and safety of dexamethasone ointment on recurrent aphthous ulceration. Am J Med. 2012 Mar. 125 (3):292-301. [Medline]. Meng W, Dong Y, Liu J, Wang Z, Zhong X, Chen R, et al. A clinical evaluation of amlexanox oral adhesive pellicles in the treatment of recurrent aphthous stomatitis and comparison with amlexanox oral tablets: a randomized, placebo controlled, blinded, multicenter clinical trial. Trials. 2009 May 6. 10:30. [Medline]. Khandwala A, Van Inwegen RG, Charney MR, Alfano MC. 5% amlexanox oral paste, a new treatment for recurrent minor aphthous ulcers: II. Pharmacokinetics and demonstration of clinical safety. Oral Surg Oral Med Oral Pathol Oral Radiol Endod. 1997 Feb. 83 (2):231-8. [Medline]. Bonitsis NG, Altenburg A, Krause L, Stache T, Zouboulis CC. Current concepts in the treatment of Adamantadies-Behçet’s disease. Drugs Future. 2009. 34:749–63. Chavan M, Jain H, Diwan N, Khedkar S, Shete A, Durkar S. Recurrent aphthous stomatitis: a review. J Oral Pathol Med. 2012 Sep. 41 (8):577-83. [Medline]. Altenburg A, Abdel-Naser MB, Seeber H, Abdallah M, Zouboulis CC. Practical aspects of management of recurrent aphthous stomatitis. J Eur Acad Dermatol Venereol. 2007 Sep. 21 (8):1019-26. [Medline]. Elad S, Epstein JB, von Bültzingslöwen I, Drucker S, Tzach R, Yarom N. Topical immunomodulators for management of oral mucosal conditions, a systematic review; Part II: miscellaneous agents. Expert Opin Emerg Drugs. 2011 Mar. 16 (1):183-202. [Medline]. Belenguer-Guallar I, Jiménez-Soriano Y, Claramunt-Lozano A. Treatment of recurrent aphthous stomatitis. A literature review. J Clin Exp Dent. 2014 Apr. 6 (2):e168-74. [Medline]. Sharquie KE, Helmi RM, Noaimi AA, Kadhom AA, Al-Hayani RK. Therapeutic role of isotretinoin in the management of recurrent aphthous stomatitis (Single-Blind Controlled Therapeutic Study). J Cosmetics Dermatological Sciences and Applications. 2015. 5:15-21. Gorsky M, Epstein J, Rabenstein S, Elishoov H, Yarom N. Topical minocycline and tetracycline rinses in treatment of recurrent aphthous stomatitis: a randomized cross-over study. Dermatol Online J. 2007 May 1. 13 (2):1. [Medline]. Clemente Rodríguez de Rivera E, Rodríguez de Rivera Campillo E, E. Jané Salas, Albuquerque R, López JL. O10364 Effectiveness of Bexident Post in the treatment of recurrent aphthous stomatitis. Oral Surg Oral Med Oral Pathol Oral Rad. 2014. 117(5):e382. Descroix V, Coudert AE, Vigé A, Durand JP, Toupenay S, Molla M, et al. Efficacy of topical 1% lidocaine in the symptomatic treatment of pain associated with oral mucosal trauma or minor oral aphthous ulcer: a randomized, double-blind, placebo-controlled, parallel-group, single-dose study. J Orofac Pain. 2011 Fall. 25 (4):327-32. [Medline]. Buchsel PC. Polyvinylpyrrolidone-sodium hyaluronate gel (Gelclair): a bioadherent oral gel for the treatment of oral mucositis and other painful oral lesions. Expert Opin Drug Metab Toxicol. 2008 Nov. 4 (11):1449-54. [Medline]. Ludlow JB, Kutcher MJ, Samuelson A. Intraoral digital imaging documenting recurrent aphthous ulcer healing in 2-octyl cyanoacrylate versus sham-treated lesions. Oral Surg Oral Med Oral Pathol Oral Radiol Endod. 2000 Apr. 89 (4):425-31. [Medline]. Campisi G, Spadari F, Salvato A. [Sucralfate in odontostomatology. Clinical experience]. Minerva Stomatol. 1997 Jun. 46 (6):297-305. [Medline]. Ricer RE. Sucralfate vs. placebo for the treatment of aphthous ulcers: a double-blinded prospective clinical trial. Fam Pract Res J. 1989 Fall-Winter. 9 (1):33-41. [Medline]. Halaszynski T. Management of Oral Ulcers and Burning Mouth Syndrome. Vadivelu N, Vadivelu A, Kaye AD, eds. Orofacial Pain: A Clinician’s Guide. Cham, Switzerland: Springer; 2014. 103-14. Pinto A, Lindemeyer RG, Sollecito TP. The PFAPA syndrome in oral medicine: differential diagnosis and treatment. Oral Surg Oral Med Oral Pathol Oral Radiol Endod. 2006 Jul. 102 (1):35-9. [Medline]. Femiano F, Buonaiuto C, Gombos F, Lanza A, Cirillo N. Pilot study on recurrent aphthous stomatitis (RAS): a randomized placebo-controlled trial for the comparative therapeutic effects of systemic prednisone and systemic montelukast in subjects unresponsive to topical therapy. Oral Surg Oral Med Oral Pathol Oral Radiol Endod. 2010 Mar. 109 (3):402-7. [Medline]. Katz J, Langevitz P, Shemer J, Barak S, Livneh A. Prevention of recurrent aphthous stomatitis with colchicine: an open trial. J Am Acad Dermatol. 1994 Sep. 31 (3 Pt 1):459-61. [Medline]. Dixon AJ, Wall GC. Probable colchicine-induced neutropenia not related to intentional overdose. Ann Pharmacother. 2001 Feb. 35 (2):192-5. [Medline]. Brown RS, Bottomley WK. Combination immunosuppressant and topical steroid therapy for treatment of recurrent major aphthae. A case report. Oral Surg Oral Med Oral Pathol. 1990 Jan. 69 (1):42-4. [Medline]. de Abreu MA, Hirata CH, Pimentel DR, Weckx LL. Treatment of recurrent aphthous stomatitis with clofazimine. Oral Surg Oral Med Oral Pathol Oral Radiol Endod. 2009 Nov. 108(5):714-21. [Medline]. Femiano F, Gombos F, Scully C. Recurrent aphthous stomatitis unresponsive to topical corticosteroids: a study of the comparative therapeutic effects of systemic prednisone and systemic sulodexide. Int J Dermatol. 2003 May. 42 (5):394-7. [Medline]. Jacobson JM, Greenspan JS, Spritzler J, Ketter N, Fahey JL, Jackson JB, et al. Thalidomide for the treatment of oral aphthous ulcers in patients with human immunodeficiency virus infection. National Institute of Allergy and Infectious Diseases AIDS Clinical Trials Group. N Engl J Med. 1997 May 22. 336 (21):1487-93. [Medline]. Thornhill MH, Baccaglini L, Theaker E, Pemberton MN. A randomized, double-blind, placebo-controlled trial of pentoxifylline for the treatment of recurrent aphthous stomatitis. Arch Dermatol. 2007 Apr. 143(4):463-70. [Medline]. Hamdy AA, Ibrahem MA. Management of aphthous ulceration with topical quercetin: a randomized clinical trial. J Contemp Dent Pract. 2010 Jul 1. 11 (4):E009-16. [Medline]. Albrektson M, Hedström L, Bergh H. Recurrent aphthous stomatitis and pain management with low-level laser therapy: a randomized controlled trial. Oral Surg Oral Med Oral Pathol Oral Radiol. 2014 May. 117 (5):590-4. [Medline]. Demetriades N, Hanford H, Laskarides C. General manifestations of Behçet's syndrome and the success of CO2-laser as treatment for oral lesions: a review of the literature and case presentation. J Mass Dent Soc. 2009 Fall. 58(3):24-7. [Medline]. Arikan OK, Birol A, Tuncez F, Erkek E, Koc C. A prospective randomized controlled trial to determine if cryotherapy can reduce the pain of patients with minor form of recurrent aphthous stomatitis. Oral Surg Oral Med Oral Pathol Oral Radiol Endod. 2006 Jan. 101(1):e1-5. [Medline]. Eversole LR, Shopper TP, Chambers DW. Effects of suspected foodstuff challenging agents in the etiology of recurrent aphthous stomatitis. Oral Surg Oral Med Oral Pathol. 1982 Jul. 54(1):33-8. [Medline]. Hay KD, Reade PC. The use of an elimination diet in the treatment of recurrent aphthous ulceration of the oral cavity. Oral Surg Oral Med Oral Pathol. 1984 May. 57(5):504-7. [Medline]. Wright A, Ryan FP, Willingham SE, et al. Food allergy or intolerance in severe recurrent aphthous ulceration of the mouth. Br Med J (Clin Res Ed). 1986 May 10. 292(6530):1237-8. [Medline]. Lalla RV, Choquette LE, Feinn RS, Zawistowski H, Latortue MC, Kelly ET, et al. Multivitamin therapy for recurrent aphthous stomatitis: a randomized, double-masked, placebo-controlled trial. J Am Dent Assoc. 2012 Apr. 143(4):370-6. [Medline]. Axell T, Henricsson V. Association between recurrent aphthous ulcers and tobacco habits. Scand J Dent Res. 1985 Jun. 93(3):239-42. [Medline]. Bittoun R. Recurrent aphthous ulcers and nicotine. Med J Aust. 1991 Apr 1. 154(7):471-2. [Medline]. Sawair FA. Does smoking really protect from recurrent aphthous stomatitis?. Ther Clin Risk Manag. 2010 Nov 22. 6:573-7. [Medline]. [Full Text]. Hill SC, Stavrakoglou A, Coutts IR. Nicotine replacement therapy as a treatment for complex aphthosis. J Dermatolog Treat. 2009 Oct 13. [Medline].